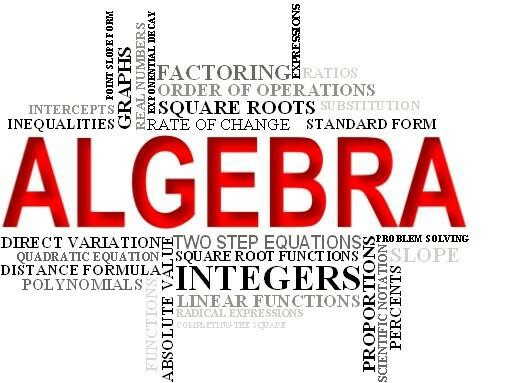 Why do kids struggle with Algebra? We’ve asked algebra teachers what skills they wish their students were better at coming into Algebra class? Their answers were always the same 3 skills: Multiplication facts, Fractions, and Integers. So why are kids universally weak in these 3 areas? ​Multiplication facts – Most kids just don’t know them well enough. They’ve learned a song or jingle to help them count up by instead of just learning an individual fact. This makes them always have to take the long counting route to come up with the answer. If they get off on their counting along the way, they end up at the wrong answer. Since Algebra has so much multiplication in it, the faster they can pull the facts from memory, the more efficient and less frustrating the work is going to be. At this point, kids are also now able to use calculators, so they start to get out of practice on their basic skills. They lose the ability to check the reasonableness of the answer given by the calculator. In fact, there are many area of Algebra where calculators cannot help. Fractions - In all of math, fractions are the skill that most kids lack. Usually when a fraction shows up in a problem, there is no quick review given to remind students how to do it. In fact, we see many students skip the problems that contain fractions. The problem is, most of your daily life contains fractions: 1/2 tank of gas, 5/8" wrench, 3/4 cup of sugar. Our kids need to feel comfortable with fractions, so they can function as adults. For more information on why kids struggle with fractions, visit our fractions page. The fact is – unless your child has a solid foundation in these skills and confidence in their ability, they will continue to struggle in Algebra and beyond. The skills and concepts are only going to build and become more complex, so making sure they know what they are doing now will set them up for success. I have nothing but good to say about Mathnasium and the positive results my daughter has had from her experience! I cannot say enough positive things about Mathnasium. Neetha and all of the teachers are focused, positive and create such a caring environment. They really do make learning math interesting and nonintimidating. I have grown to really rely on Mathnasium to ensure my son is developing a strong foundation in math concepts, as well as the help they provide with the areas of difficulty. This Mathnasium at the South Meadows location in Reno, NV is the best!!! Everyone that works there is soooo friendly, knowledgeable and hellpful!! If you are looking for tutors to help your kids get and stay on the right track with learning math....this is the place where they will truly get the help they need!! 😀 THANKS Neetha & staff!!! We rely on mathnasium to provide a solid foundation in math. We have two kids in the Mathnasium program, and without Mathnasium, our kids would either be struggeling or have many gaps in the esencial foundation needed to succeed in math. Mathnasium is responsible for our kids getting ahead of their school curriculum and developing a strong base in math. My child no matter how bad of a day he was having would come out from his math session with a big smile on his face. Mathnasium boosted his skill level and gave him confidence. If your child is having trouble with math I would highly recommend you try Mathnasium. Made a difference within 1 day on my daughter's tests and homework- thank you. Neetha and the staff have been so kind and helpful in teaching our son many needed math concepts. Since starting Mathnasium our son has more than doubled his MAP score. We appreciate all our son has learned while at Mathnasium. Thank you very much! You’ve made learning math enjoyable for my teenage daughter. My daughter has been going to Mathnasium scence the doors opened. She has maintained an A in her math classes and lives math. The tutors are wonderful! We plan on our daughter to continue to go untell she finishes high school. Our now 4th grader began her sessions at mathnasium in 6/2018 so she can keep up with her math skills over the summer. She began with a slightly fearful relationship with math, she was not confident in her understanding of math and didnt raise her hand up in her 3rd grade class during math time. After having attended mathnasium over the last 4 months her confidence grew by 100%. She began to look forward to her sessions and excitedly share what material she had gone over in the sessions and how she easily conquered the math problems. Initially, our goal was only to grow her familiarity with math so she wouldnt be intimidated by it and increase her comfort level so, 4 months in, we have accomplished that objective. We have decided to keep her in mathnasium through the end of 12/2018 so that she can maintain her math skills at her 4th grade level and maintain her confidence level. If there is an inkling she is able to exceed meeting 4th grade level we will keep her sessions through 6/2019 to allow her to explore how much more she can improve and advance her skills. So, without a doubt we would recommend mathnasium to friends or family. I cannot say enough positive adjectives about this Mathnasium!! The owner Neetha is such a wonderful person and so accommodating to get my son in at last minute for his private tutoring sessions. The staff is so knowledgeable, friendly and teach in a way that not only is fun for the students, but they actually learn as well.....what a concept! Definitely a win win scenerio!! :) Thanks Mathnasium!! Got my son back on track with math! We like the one on one tutoring, we found that the most helpful . Our son started Mathnasium in August. He absolutely loves it. Math was always a battle with him, and now I hear words like "fun" when we talk about it. He has brought his grade up from low C to a very high A. I would recommend this to any parent whose kid has a gap in their mathematics, battles them to do their math homework, and just wants that extra help. The staff is very kind and my son loves working with all of the tutors. Fun and exciting learning environment. My son loved every second of being there and now has a deeper love for math! my student thanks all the tutors at Mathnasium.... but Special Thanks goes to Makela..... she worked extra special with my student and made a very good impression. My son likes all of the instructors and feels like they explain the math to make it very easy to understand. He won't tell you, but he doesn't mind going which is huge! Mathnasium has made a world of difference for my granddaughter! She excels in math at school! I like the fact that an assessment of math skills is done at the beginning, and then a plan is formulated to address skills that need improving. The skills-based approach, that builds upon the mastery of prior skills is the only way I believe math is effectively learned! Mathnasium has been a total blessing for our family. My daughter was feeling extremely frustrated when doing her Math homework. Frankly, my husband and I were, too. She is building her confidence with every visit, and she absolutely loves going! Highly recommended! Great people and a great experience. Our daughter is doing very well in Math thanks to Mathnasium! Great place for kids to learn math. They make it fun for them. My son is loving his experience at Mathnasium. He enjoys it and feels it’s helping him improve his math skills. My daughter is now grasping the concept of Math. Thank you! My daughter's math grades are improving and most importantly, so is her attitude toward math! Neetha has been a great support for us! My son enjoys going there. She has helped motivate him. You were a huge help in my son gaining confidence with math. We loved that it was a drop in style versus a set time. Thank you for all you and your team did to help him succeed in math! My daughter has always struggled with and hated math. After enrolling her at Mathnasium, we have seen her interest for math grow stronger after each visit. We are encouraged by her excitement. I would highly recommend Mathnasium. My daughter used to cry every time we did math homework. Now she loves math because of Mathnasium! The people are amazing! I am so grateful for the fun learning atmosphere that makes my daughter ask if she can continue Mathnasium after our year is up. Mathnasium has been a Valuable resource for my son ! Thank you ! My child looks forward to math. This has NEVER happened! Daughter went from a 37 and hating math to a 97 and now thinks math is fun. Best of all no more fights about trying to help her myself. My daughter didn't need a ton of help just a bit to catch up. They were able to individualize her experience and give her help on various homework and projects as well. Loved our time there. My daughter had only attended Mathnasium for 5 weeks. She had made 16% improvements in Level 3 math and now moving to Level 4. Mathnasium makes math fun and easy for students to understand. Students love the rewards for completing assignments. Neetha the director is always present and willing to help with questions. The tutors are friendly and approachable to students. I highly recommend Mathnasium for students who are yet to find Math fun. Thank you Mathnesium! My daughter now loves math! Great tutors. Unfortunately, too far for us to make it as frequently as I would have liked. My son is loving his time here! He even told me, " they're helping me not use my fingers to count!" Awesome place!! I love bringing my grandson there! He has struggled with math, and has been known to get a bad attitude, but he comes out smiling. All the staff have been very good with him, and the owner is delightful. I like the email communication with regard to my son's progress and the identified areas of study. Griffin likes the rewards. Taylor doesn't ever want to go "do Math" but at pick up she is always happy, even wants to stay! It's funny to us and we will continue 2-3 times a week because her math grade continues to improve and her confidence in math is obviously better! The staff are fun and engaging and positive people, too! Thank you! Our daughter's confidence and skill set has greatly improved in her 5 months at Mathnasium. We love the Double Diamond location, owner and staff! Thank you! My daughter loves going. She already loved math but needed​ help in some specific areas. I love how they tailor her help! We have signed both of our daughters up for tutoring, and they are both excited and eager to attend their learning sessions. Can't wait to see their improvement! My son hated math and was failing miserably. By enrolling him in MathNasium, he learned at his own pace with people who cared about his success! He looked forward to going and see his friends and showing them what he could do! They cared about him! When we relocated to another state, his first day at school he felt successful and came home to tell me that his favorite class was math! Thank you so much for your program! Ben enjoys going to Mathnasium. He always reports positive feedback about the helpfulness and friendliness of the staff. He feels as thought he's learning and gaining confidence in his skills. Ian was greatly helped in Math and has As. Thanks so much! from the staff to the owners, this place is A+! My daughter is no longer afraid of math and now has an arsenal of tools to use when she approaches a math problem. We love it here. My boys really enjoy going to Mathmasium. The class has helped them in school and they are feeling more confident. Everyone is always very pleasant and helpful. My son would not not have passed without them. Thank you so much! My son has had a wonderful experience at Mathnasium, and we hear nothing but the same from friends who attend. The methodology seems to be highly effective, and I am so grateful to Mathnasium for the positive experience the staff has provided. Thank you! They put the love back into learning math! Wonderful program!! I wish there was a Mathnasium closer to my home!!! Ian has really benefited from summer math tutoring. He feels that the teachers are on his side and don't make him feel bad if he makes a mistake but instead help him to get the right answer. Thanks so much! My daughter's progress and confidence in math is fantastic thanks to the lesson plan and individual help at Mathnasium. Math is foundational, so I'm so glad I invested to get the help for my daughter sooner rather than later. She knows now that math is a skill and she understands the concepts much better. Thanks Mathnasium! MATHNASIUM WAS THE BEST THING FOR MY HIGH SCHOOL SENIOR. HE WAS ABLE TO GET HELP AS A FLEXIBLE SCHEDULE AND HE PASSED THE AP CALCULUS TEST AND GOT AN A IN CLASS. THANKS SO MUCH FOR ALL YOU DO. Jake is an awesome teacher to my son Cade!!! My son is taking Geometry & Jake is able to actually explain how to solve the problems and Cade understands!! Woo-hoo!!! 😀 So two thumbs 👍🏻👍🏻up for Jake who is definitely an asset to Mathnasium:). Also, Neetha is wonderful as well and ALWAYS makes it work to get Cade in for last minute privates!!! Great staff, great location!!! My son has only been attending for a month, but I think it is helping to build the foundation that he was lacking in certain areas. He missed a lot of school due to illness. Because of that, he did not have a good grasp of some foundation pieces. I think Mathnasium is helping him rebuild those areas. Neetha does an extremely efficient job of running her center. She has assembled a stellar staff and created a warm, welcoming environment for the students receiving tutoring services. My daughter grew leaps and bounds in terms of actual math skill proficiency, but more importantly, in math confidence. We love Double Diamond Mathnasium! My son enjoys Mathnasium, and his comfort with math and abilities to problem solve are increasing. Thank you! Math was a bad word to my daughter. She was aggressive about NOT doing her math homework. We tried another math tutoring, but it did not work for her. The first week after enrolling her I would not tell her we were going to Mathnasium but the moment she recognized the route, she would start to whine. It was such a surprise that she was all smiles when I picked her up after an hour. This week she got 2 A's on her math quizzes and was so excited that something was working, she now asks to go to Mathnasium. Thank you so much for turning her attitude about math around! My kid went from a C to an A. And got caught up on things she was behind on. Big help. Staff is great. My son is catching up to his peers. They really listen to what you want your child to get out of the program and offer an individualized plan that really works. Brayden likes going to "tutoring"-he actually has fun! His math grade has improved dramatically since starting and he has a better understanding of what he's learning. We love this place! We have been so happy with our daughter's progress since signing her up with Mathnasium. Everyone is so kind and helpful and really keeps us informed. It has given a great boost of confidence to our daughter! I appreciate Neetha and her staff's efforts.